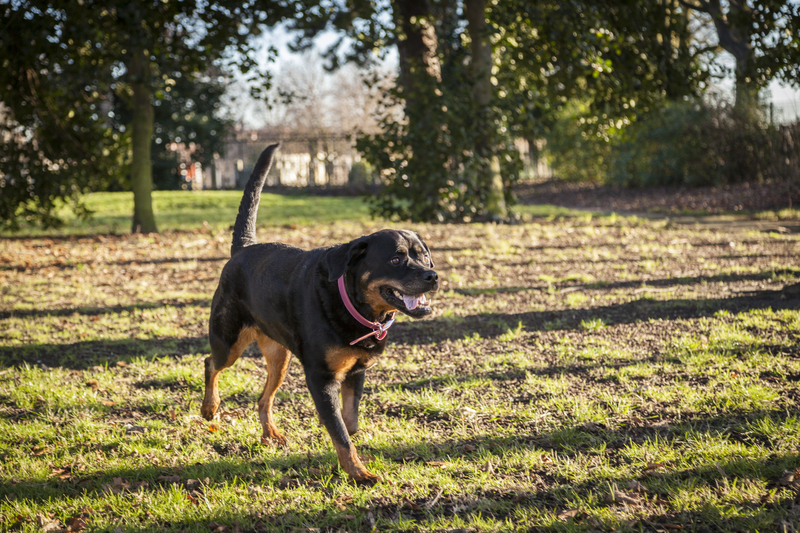 ChesterGates Veterinary Specialists regularly accept cases for investigations and management of urinary obstruction, incontinence or trauma. Common surgical causes of urinary tract disease include urolithiasis, neoplasia, ectopic ureter, urethral sphincter muscle incompetence and urinary tract rupture. Here at ChesterGates Veterinary Specialists we commonly investigate urinary tract disease with survey and contrast radiography, ultrasonography, fluoroscopy, advanced imaging (CT and MRI) and cystoscopy. In addition to the more routine surgical procedures of the urogenital tract such as nephrotomy/ nephrectomy, cystotomy, urethrotomy/urethrostomy we are able to perform more complex procedures such as treatment of ectopic ureters and ureteral anastomosis with the aid of magnifying surgical loupes and advanced imaging. 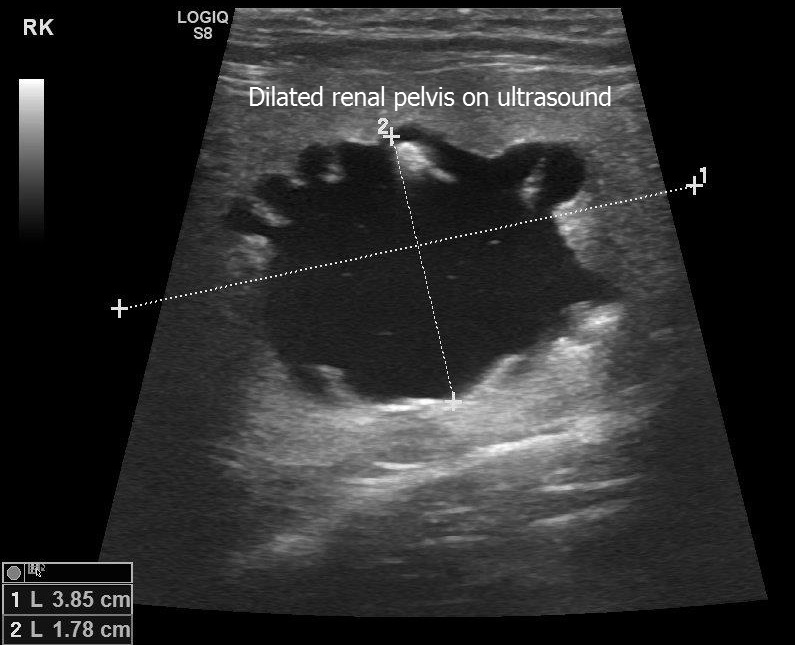 Furthermore we are able to perform interventional radiology procedures such as a Subcutaneous Ureteral Bypass System (SUBS) for the management of ureteral obstruction. Ureteric obstruction is becoming a more frequently diagnosed disease in cats. The most common cause of ureteral obstruction is calcium oxalate ureteroliths. Cats often present with vague clinical signs of renal failure and is often confused with acute on chronic renal failure. Diagnosis of ureteral obstruction includes urine analysis and culture, survey and contrast radiography and ultrasonography. Whilst medical management can be successful in a small percentage of cases, the outcome is significantly better with surgery. More historical surgical options include urethrotomy, re-implantation of the ureter into the bladder or retrograde flushing of the stones into the renal pelvis followed by a nephrotomy/pyelotomy. Due to the high risk of complications associated with these procedures, more non invasive methods of management of ureteric obstruction have been developed more recently such as ureteral pigtail stenting, Subcutaneous Ureteral Bypass System (SUBs) and lithotripsy. 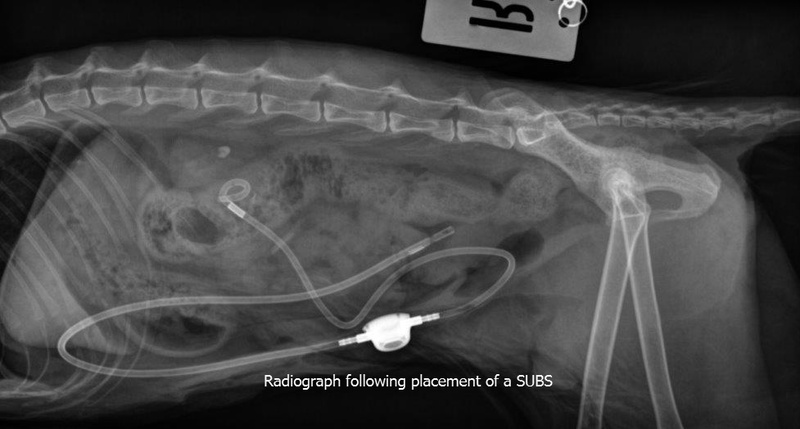 Here at ChesterGates we routinely perform a Subcutaneous Ureteral Bypass procedure (SUBs) in management of ureteral obstruction. 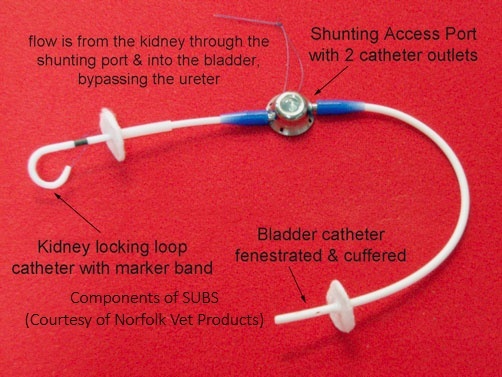 The device consists of a nephrostomy catheter as well as a cystostomy catheter which are connected to a subcutaneous port. This allows urine to bypass the ureters thereby resulting in decompression of the renal pelvis. The advantages of using this system are the reduced surgical time and long term complications in comparison to placement of ureteral stents. The use of intra-operative fluoroscopy is essential. The system requires flushing via the subcutaneous port every 3-6 months to maintain patency. This is usually performed under sedation and ultrasound guidance. Both our soft tissue surgeons are more than happy to discuss potential cases either on the telephone or email.